This is an effort to help to create a sustainability index number to provide customers with product information in a simple, convenient, easy to understand rating, so they can make choices and consume in a more sustainable way. So what does this mean to the packaging industry? 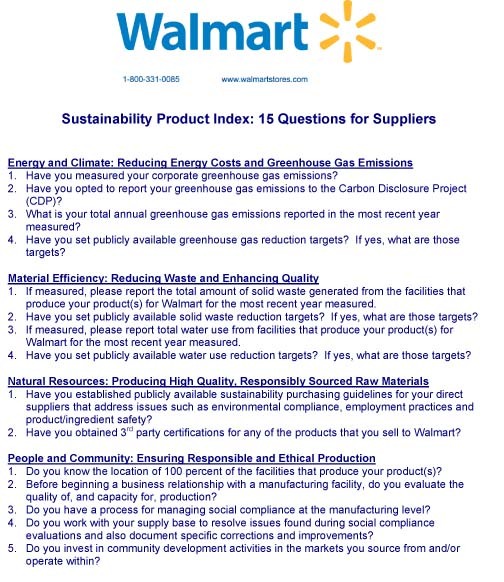 Those companies who design and develop packaging will need to know and understand these 15 questions and how they contribute to their customers’ answers as suppliers to Walmart. Have a read and let us know what you think. This entry was posted on Wednesday, July 29th, 2009 at 3:11 pm	and is filed under Business News, Design, Environmental Issues, Innovation, Materials, Opinion, Recycling, Retailers. You can follow any responses to this entry through the RSS 2.0 feed. Responses are currently closed, but you can trackback from your own site.